Call me a retro grouch. I got my first cell phone (kicking and screaming) in 2011. And I like having a book in hand to fold pages, highlight, and scribble. But I’m not the majority. People have been asking for the Kindle version, and its now live. And if you are nostalgic like me, the print version is still there as well. 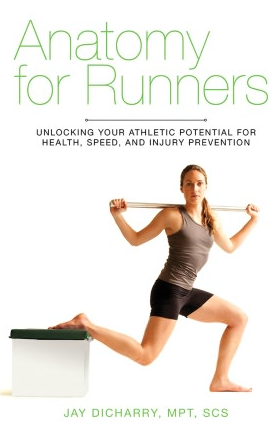 And if you’d like to see what others are saying, Eliz@beth Maiuolo, a blogger for Runner’s World had a nice review of the book here. This entry was posted in rehab, running and tagged Anatomy for Runners, Dicharry, gait analysis, medical, medicine, rebound physical therapy, running form, Running injury barefoot minimalist on January 2, 2013 by an athlete's body. Dude, we need an iBooks version! Bryan – The kindle version will run on your i-device, just use the kindle app. If you were referring to a dedicated ibooks format with embedded video and such, well……hold tight. I may get something out like this in the future. Trying, but this takes gobs of time to do it the way I’d like, and actually it will wind up an another book entirely. Thanks for your comments! LOVE the book. I’m on my 3rd read. Kindle of course. Some fantastic information. Got my balance board and just build my Si-Board. More tools in my tool kit. I’m a big fan of AIS before I run. I find it help my runs. I also do some lunges and fire hydrants. I did just find an article written a while ago that quotes you and want your take. Do you still like this as a pre run? Any other thoughts? I do “exercises” from the book through out the day, but not before I run. Final note. It seems that you work out of Bend, Or now. Wow. Though I no longer live in the area I visit once or twice a year. Next time I will make sure I schedule some time with you. Hi Eric – thanks for your kind words – so glad you are finding the book helpful! Digging up my old goods huh? Yes -the info in that article still applies today. SO many people have hip issues. Get to fixing them now. As far as when to do things, I like before, but if time is tight (like most of us) fit them in when you can. I recently got to the section in your book where you state for those who are having Achilles tendonosis issues run with loose ankles. 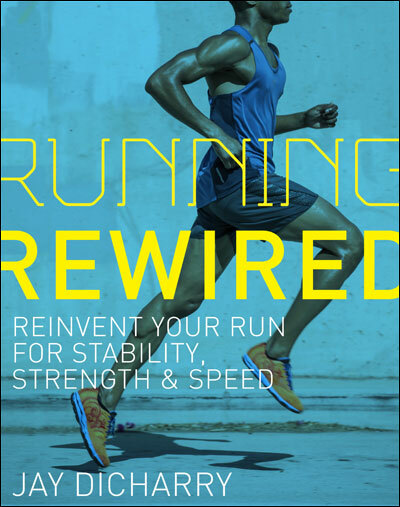 Well I notice that while I have good flexibility in my ankles I tend to run with them stiff! So now I remind myself to run loose. That simple tip is helping me recover from my condition. Thanks! Hi Jay — I am really enjoying the book and did better than I thought on my overall assessment, passing all but the ankle/balance work. I really like the rocker board used in the photos of the book and haven’t been able to identify a name or find anything online that looks like it. Are you at liberty to share that info or point towards a website that has it? I think the rocker / balance board that is featured in the pictures of Jay’s book is a Vew-Do board – the Zone Balance Pro model (http://www.vewdo.com/cart/product.php?productid=16140&cat=253&page=1). Hi Seb – yes the one in the pic is the Vew-do board. I like it a lot b/c it can do lots of different things by changing the bottom plug. If you just want a balance board, I typically steer people to sports smith.net b/c they have the cheapest rocker board I’ve found. FYI – I have no relationship with them, or any other rehab supply company. may I ask your advice on one particular issue. Since last December, I am struggling with what I think is a billateral plantar fasccitis. It hurts more persistently and more intense after my speed workouts and after my long runs – in such circumstances, I can feel annoying, but still bearable heel pain throghout the entire day. It also hurts, but less intense, when I get out of bed and after I sit for longer periods of time with my feet in dorsiflexed position. In these latter cases, pain only subsides for several minutes after I start walking. My (self-diagnosed) PF is, however, not preventing me from running. It’s important to mention that I started feeling pain under my heels after I dropped my custom orthotics and started rotating more pairs of different running shoes during my predominantly speedier workouts – from traditional lightweight, neutral trainers (Nike Pegasus 29, Adidas Adizero Boston 3) to shoes with lower offset (Saucony Ride 5, New Balance 890v2, Saucony Cortana, Saucony Kinvara 3). The custom orthotics were prescribed following a gait analysis I did in Spain, which, amongst others, revealed that I am a mild overpronator. I must confess that I read an awful lot about running and decided to drop my orthotics after reading all the recent stuff which advocates that the concept of overpronation should be banished and all support shoes should be thrown in the trash can, and that, in most cases, orthotics make your lower leg muscles lazy and, unless you’re a heavy overpronator, you should not wear them if you want to have strong legs. Also, more recently I did a second gait analysis in the UK, which, while confirming that I am a mild overpronator (due to my knock-knees), also revealed that, during the dynamic mid-stance phase, my “valgus” leg axis and overpronation is largely neutralized. The recommandation was that, while I can still wear those custom orthotics, dropping them would most likely do not make me any harm. Given the above information and recommendations, I did decide to drop my orthotics in October 2012. Ok, maybe I fell (again) in the “too much, too soon” trap. As my legs felt lighter and good without those clunky orthotics, I started running faster and felt great until, at the end of November 2012, I started feeling heel pain in both of my feet. I did a lot of stretching, foam rolling, spikey ball rolling and icing and, while the pain eased after these exercises, after my speedier or longer runs, it reappeared in full force and persisted throughout the day. Well, I found out lately that the only effective way to considerably alleviate such pain was to put those orthotics back into my running shoes! Whilst I do want to completely eliminate the orthotics some day in my quest to have stronger feet and run in lighter shoes, I do feel – at least at this stage – that they are helping me a lot in recovering from PF. As you can see, the information which is based on what I’ve read or what I’ve been told versus the information based on my own experience with orthotics is quite contradictory and confusing. Was my PF caused by dropping my orthotics or rather by the specifics of my workouts I did for 2 months (i.e. predominantly speedier sessions, from 3 to 8 miles, no orthotics, including some lower drop shoes – from 8mm to 4mm – in my rotation without a real transition, altough my calves felt fine afterwards)? I would say both, but I would welcome your (concise) opinion on this and on what to do.